I've taught hundreds of thousands of people to reduce their level of stress though mindfulness meditation. And I've taught more than a million people to play blues, rock, and folk harmonica. With results within minutes — guaranteed! Since my graduate school years (studying cognitive-behavioral psychology), I've been experimenting with different methods for teaching individuals and groups to enhance their mental focus and lower their stress level, so that they can be happier and more productive, at home or at work. After years of testing and research, I believe that I've developed the most effective way to do this for groups of any size, from one to thousands. It may sound a bit funny, but it works, in part because it's fun to do. My group presentations always begin with focus enhancement and stress reduction, but often build on those skills to teach additional content: team-building or creativity or communication skills or change management. I've created customized presentations for groups as diverse as Kraft Foods, Merck, Blue Cross/Blue Shield, the Red Cross, Ben & Jerry's Ice Cream, and the FBI. "If it's not fun, why do it? 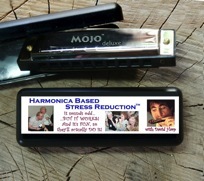 David Harp's Harmonica Based Stress Reduction method works, because it makes stress reduction, fun. So people actually do it. And keep doing it. And get the benefits that reducing stress can provide in the workplace." The process of HBSR™ is great fun. But the content is serious. 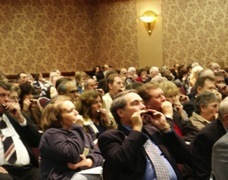 Just look at the intense focused attention shown on these folk's faces! Want to look at a few more of my clients? Hear me play some blues and rock harp? Got Questions? My next scheduled HarmonicaYoga™ workshop is at The Kripalu Center, in Lenox, MA, runs from July 14- 19, 2013. It's called HarmonicaYoga™: How to Reduce Stress, Increase Mindfulness, and Blow Your Blues Away Instantly! I'll also be offering a one day Mindfulness and the Art of the Harmonica: Play Blues, Rock, Folk, and Classical Music Today! at Manhattan's New York Open Center on June 30, 2013. Please click on the link for more information and to register, or call 212-219-2527 Ext. 2 to register.